Have you found an online vendor selling Doorly's 12-Year? Thank you Richard Seale. Thank you Total Wine. Thank you for bringing great rums to the masses for an affordable price. This is my new number one and only $25! If you have a chance, get some. Just a bit deeper that the XO, which is also fantastic. I'm not about the sugar and additive controversy, but what a great way to show the industry how it's done without them. Another home run from Seale, Foursquare, Doorlys. OK, it taste like a Barbadian rum, but there's something unique. Ash? pickles? IDK, but whatever it is, it's good. Dry with cherries and the requisite Barbados bananas, also a nice long finish that dare I say, is better than the R L Seale. The more I come back to this the more I like it, especially paired with the XO. 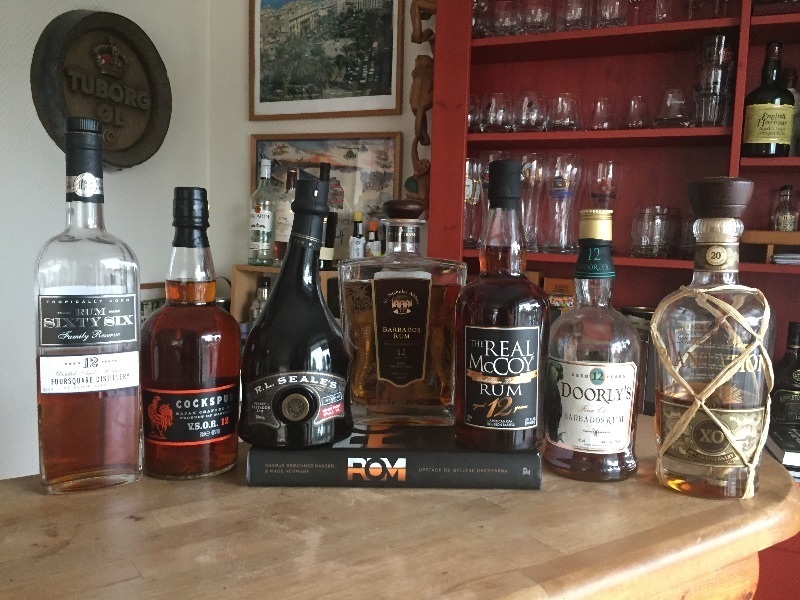 The more rums I sample from R.L. Seale & Co. the more impressed I am with Richard Seale. There seems to be something almost mythical about the man in the rum world. I read so many positive things about him and how he produces rum. Nothing hidden. No semantics games on the labels. No additives. It is what it is. Also the use of macaws, parrots, et al on the labels is a bonus for me. I have a very spoiled cockatiel named Cheech who would love to be on a Doorly's label. The color is a rich amber and is very clear. No murkiness or spottiness at all. It demonstrates excellent legs in my snifter when swirled. Leaving droplets that eventually make their way to the bottom of the snifter. The aroma is excellent and inviting. Again I must confess that I cannot distinguish individual odors but will tell you the aroma is one that I like. The flavor is outstanding. A slight sweetness on the outset with a little butteriness. The oak is present but mild. This is a smooth rum well deserving to be a sipper's rum. However versatile enough to work well as a mixer. And at $25 a bottle it is a great bargain for the high quality rum. I detect some hints of vanilla and other subtle flavors. Rather complex but not overwhelming. The finish is a combination of the molasses from the cane and the tannins from the oak. A rather interesting balance. And a very smooth rum. Doorly's continues to be a brand worth seeking. No one locally sells it. I had to go to Jacksonville to discover it. Well worth it. Definitely will pick up a spare bottle when I am in that neck of the woods. I recommend this rum highly. The screw-cap is a turn off and when I filled my first glass I regarded the scent more neutral than rounded but after taking my first sip I was in love. This is the essence of Barbados rum. A great everyday sipper. But just slightly rounder than the XO. This rum incorporates everything I love about the Barbadian style. Elegant, characteristic, "pure" and well priced. The nose is lovely with a bit of sweet coconut, vanilla, oak, and a hint of nougat and orange. In the mouth I pick up a lighter, juicy character consisting of oranges, banana, vanilla and light oak. It's very "fresh" and clean with a subtle and natural sweetness. The finish is warming, tingling and a little spicy, but not very lengthy. Considering the price though, it's just beautiful rum. Once again, hats of to mr. seale. Shrnutí:	Ochutnal jsem již několikrát, mám doma lahev. Kdo hledá méně sladkosti, je na dobré adrese. For the low price of only $24.99 (Total Wine & More), I didn't expect this rum to live up to it's rating (currently an 8.1). But it does. Smells and tastes of caramel, a peppery spice, bourbon, and oak. I rate it a solid "8", which for the price is a bargain! Another well tasting rum from Barbados. I really like the rum from R.L. Seale’s. Smoother than the Doorly's XO and significantly different - the younger Doorly's has more of a classic caramel/oak flavor while the elder has a deeper oaky flavor with hints of dried fruit. Both are delicious natural rums and some may call them "hot" compared to other sugary rums. The barrel aging really imparts a lot of flavor over the years. You get a lot of oaky bourbony flavor in this but it's not quite as sweet as bourbon itself. Update: I finally got a chance to try this side by side with MGXO which is lighter tasting, not as bold/sharp as the Doorly's 12 as well as being fruitier with more sweetness and vanilla. Doorly's 12 in comparison has more of a whiskey flavor and the age gives it a more funky wood/chocolate/dried fruit character. Update: loving this all over again, recently had real mccoy 12 year which helped me to taste the bourbon flavor in this rum even more and further notice the fruitiness not found in whiskeys. Time helps it so much as well. Can't beat it for the price! Drink it neat at room temp or with a spoon of water added. i smell the great wide world of rum! grpe, raisins and chocolate! some spice. i taste dark chocolate, some wine, fruity raisins and toffee with peppery notes. 10/10 - drop 5 points if diplomatico is a good rum for you! medium body, full of the taste of the aging in olorosso casks. tons of fruit and choclate made this to a very special and tasty after dinner rum! wonderful! As a huge fan of Foursquare, I had to try the Doorly's line and thought i would start with their aged sipper. I am not disappointed. The taste is drier than the sweet nose would imply. Lots of rich flavors combine in as smooth a sipper as they come. As I expected. Slight sweetness in smell. There is lot of body and very smooth to drink. In this price range, not many better rums. Surprisingly delicate and light on its feet for 12 years of age. Fun to taste, this is a cognac lover's rum, with floral aromas and flavors. Eminently sippable, and fun to ponder over. Punches well above its price. Rich, spicy, fullish bodied. The 8yo I thought was great, maybe a touch too oaky from the American Oak (but I like that) but the 12yo is a whole different level. Much more concentrated and complex, and while there are plenty of oak notes, it doesn't make such a prominent appearance. Dry, long and luscious. Plutôt doux et rond (pour un rhum non sucré, je précise! ), j'y retrouve des caractéristiques typiques de la Barbade et de la distillerie Foursquare sans être non plus un copié-collé du RL Seale's 10 (que je préfère mais c'est plus une question de goûts personnels). Le prix est plus que correct pour un rhum de 12 ans. Bref un bon rhum, parfait pour découvrir ce qu'est un vrai rhum non trafiqué sans se ruiner. Quite on the sweet side (for a non-sugared rum I mean). I found it typical from both Barbados and the Foursquare distillery. There are some features which remind me the RL Seales's 10y (which I still prefer - just personnal taste) but it is not just a clone, this one has his own caracter. The price is very attractive for a 12y rum, it is perfect if you want to discover "true, not sugar-wasted" rums. Sugar: 0-5 GPL. There is no added sugar in most if not all Bajan rums and any sweetness occurs naturally. This one is no exception. This is a very good Bajan rum and I tasted butterscotch, oak, a trace of chocolate and fruits, perhaps coconut and banana. The strongest taste was the butterscotch and oak. Overall it's very dry and the tastes fade with the burn of a pure rum. I added a drop of water to open it up and take the edge off the burn. Mix or sip depending on your tastes. I picked up a bottle of this on the recommendation of a co-worker. Coming from bourbon country, I really enjoy the of Doorly’s 12, with the barrels and smoke coming though just enough in a balanced profile to make me think this is the missing link between rum and bourbon. I considered giving this an 8, but looking at others that I’ve given an 8, it falls a little short. It’s a very smooth rum with a good balance. It’s dry but not too dry. Unless you like VERY sweet rums, you’ll like this one. I couldn’t give it an 8 because it lacks character and depth. Others seem to disagree, so perhaps I need to try another bottle. The only distinctive flavor or smell is the oak, which is pleasant and not overpowering. I could drink Doorly’s 12 year-old as a sipper but it just isn’t distinctive enough to love. But, if I had $25 and needed an excellent bottle of rum, I think this just beat out Bacardi 8 as my first choice. Maybe it is too soon to review, but this was no special experience for me. Next week I won't even remeber that I had it. Delicious! This is a really good rum in my opinion! I decided to try it since i've seen a lot of good reviews about it here on Rum Reviews and it was absolutely worth it. For only $24.99 at Total Wines this baby just became one of my favorites. La verdad no esperaba mucho de este ron, sin embargo es un gran ron pensando en la relación de precio va sabor. Tiene la escénica de Barbados, un no tan dulce, ron seco con notas a caramelo. Nice bottle and beautiful amber color, this rum. This rum has very pastry aromas with almonds, vanilla and spices. It is very soft but the finish is not very long. Excellent value for money but it's not me. Very pure Barbadian rum. No added sugar or anything artificial. Very subtle aromas. Dry and smooth, a little bit of vanilla and oak. Also very distinct notes from the Sherry/Madeira casks. Very good and a fantastic value for the money.